LONDON - The world’s oldest man, 113-year-old World War I veteran Henry Allingham, died yesterday after spending his final years reminding Britain about the 9 million soldiers killed during the conflict. 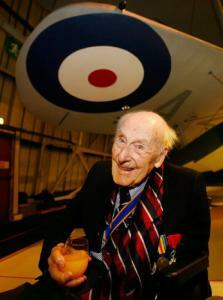 Allingham was the last surviving original member of the Royal Air Force, which was formed in 1918. He made it a personal crusade to talk about a conflict that wiped out much of a generation. Though nearly blind, he would take the outstretched hands of visitors in both of his, gaze into the eyes of children, veterans, and journalists and deliver a message he wanted them all to remember. Only a handful of World War I veterans remain of the estimated 68 million mobilized. There are no French veterans left alive; the last living American-born veteran is Frank Woodruff Buckles of Charles Town, W.Va.
Born June 6, 1896, Allingham left school at 15 and was working in a car factory in East London when the war broke out in 1914. “To be honest, all the planes were so flimsy and unpredictable - as well as incapable of carrying large fuel loads - at the start of the war that both British and German pilots would immediately turn back rather than face each other in the skies if they did not enjoy height supremacy,’’ Allingham would later write. As a mechanic, Allingham’s job was to maintain the rickety craft. He also flew as an observer on a biplane. At first, his weaponry consisted of a standard issue Lee Enfield .303 rifle - sometimes two. Parachutes weren’t issued. He fought in the Battle of Jutland, the largest naval battle of World War I. He served on the Western Front. After the war, he worked at the Ford motor factory and raised two children with his wife, Dorothy. She died in 1970, and when his daughter Jean died in 2001, friends say he waited to die, too. That’s when he met Goodwin, a lay inspector for nursing homes, who realized that veterans of Allingham’s generation were not getting the care they needed to address the trauma they had experienced. He encouraged Allingham to share his experiences and the veteran soon began talking to reporters and school groups, the connection to a lost generation. He found himself leading military parades. He was made an Officer of France’s Legion of Honor. He met Queen Elizabeth II and wrote his autobiography with Goodwin, “Kitchener’s Last Volunteer,’’ a reference to Britain’s minister for war who rallied men to the cause. Allingham remained outspoken until his death.